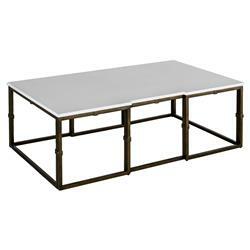 Add an eclectic touch to a living room or office this modern cocktail table. An exercise in balance and symmetry, clean white and brushed gold are a clean finish on the updated design. The painted white sea grass top is generously sized. Adorn it with decorative accents and invite all-inclusive conversation around this coffee table.